2015- I project managed the creation of this Custom Letraset Wallpaper Mural Design by Begson for the client Creative Recreation. Sustainable, reusable wallpaper printed by Walls360. 33' wide x 12' tall. Creative Recreation was founded in Los Angeles in 2002 with the sole purpose of designing footwear that fuses work and play. Inspired by the spirit of street art - with its bold creative expression and out of bounds thinking - Creative Rec doesn't sit quietly or complacently on the sideline. They thrive in energy-charged environments, where statements are made and are unified by a single idea - that creativity matters. 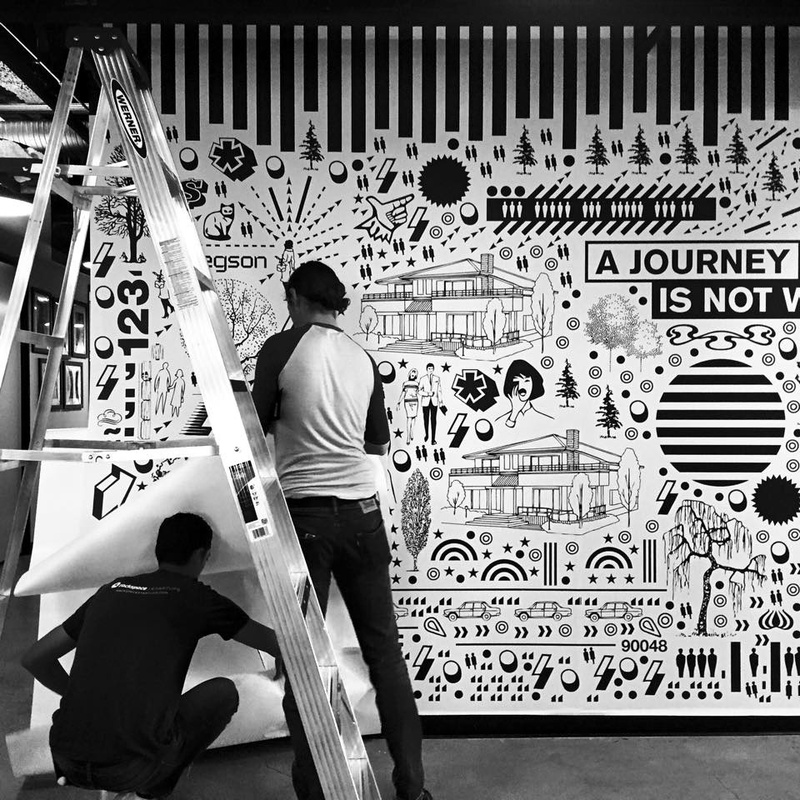 Begson created a custom 10 foot by 35 foot wallpaper design for Creative Recreation's Los Angeles office space. Printing and installation by walls360. He approached this design with a bold approach towards lifestyle, design and art. We live in a chaotic world, but in his art pieces, he creates a sort of order within that chaos. This specific piece is a journey of growth of not only the company, but as how designers and leaders grow and change with bursts of high energy and positivity constantly re-emerging from change throughout the piece. Begson likes to include elements of nature in his designs, especially for indoor spaces because it helps keep people at ease.